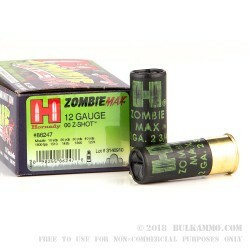 When undead pandemic threatens the safety of you and your family, turn to Hornady Zombie Max ammo. Fired from your trusty boom stick, these shotshells will send 12-gauge 00 lead buckshot flying at 1510 fps and put a quick stop to the brain-munching horde. Made to the same high standards of quality as all other Hornady ammunition, these shells offer excellent self-defense performance to ensure that your grey matter stays right where it belongs—safely inside your noggin! Hornady of Grand Island, Nebraska has produced premium ammunition loading components since 1949, acting as a key supplier to many other ammunition loaders. 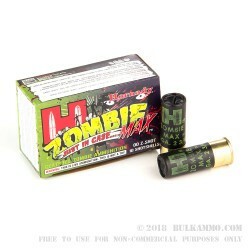 The 1990s marked a major strategy shift for the company as it began introducing its own brand of self-defense and hunting ammunition including the humorously named Zombie Max line. The idea for Zombie Max originated with company president Steve Hornady, son of founder J.W. Hornady, who, after exhaustive research of past zombie disasters documented in works such as “Dawn of the Dead” and “World War Z,” concluded existing preparations for a potential zombie apocalypse were inadequate. 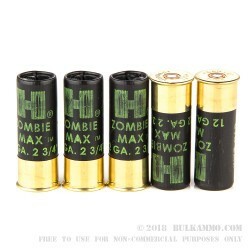 To prevent a repeat of prior experiences in which would-be survivors wasted vast quantities of FMJ ammo in a vain attempt to stop the horde, Zombie Max ammo comes only in hollow-point (available for many popular rifle and pistol calibers) and buckshot varieties. 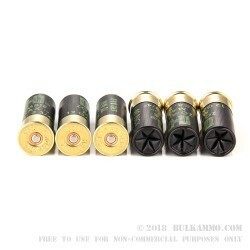 Q: Does this round have 8, or 9 00buck pellets? A: Hello Jason, Hornady lists this round as being loaded with 8 pellets of 00 Buck.